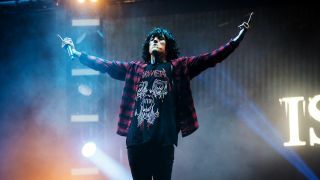 Despite ketamine addiction fight, BMTH frontman says acid "used to be adventure"
Bring Me The Horizon frontman Oli Sykes believes everyone should try taking drugs. Sykes tells Metal Hammer: “I don’t regret taking drugs – and I don’t know if I should say it, but everyone should do drugs at some point in their life. BMTH released fifth album That’s The Spirit last week. They begin a European tour in November.Read the full interview in the current issue of Metal Hammer magazine, available now in print, digital and via TeamRock+.